THE site of a low cost accommodation facility that was shut down by Toowoomba Regional Council last year has gone on the market for over $3m. 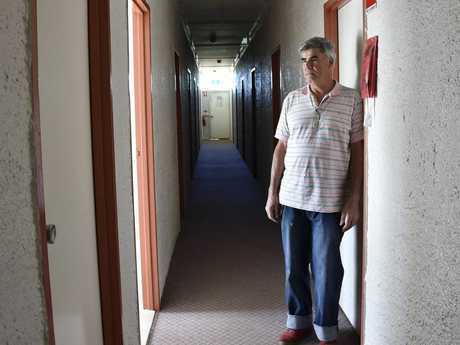 In April last year 25 residents were evicted from the Darling Heights Lodge after the 105 room facility was closed due to non-compliance with the Building Act. The manager at the time, Haviv Alfassi said council had been "ruthless" and "unjustified" in its shock decision. The Handley St site has been listed through The Real Estate People - Toowoomba for $3.4m. The lodge had been operating for 11 years as a low-cost accommodation facility for pensioners, students and low-income earners. Mr Alfassi admitted at the time the site had building and safety issues that needed addressing, but disagreed that the lodge should have to shut. The lodge sits on 2.02 hectares of land behind the University of Southern Queensland. The advertisement for the site lists potential for an aged care resort, motel units or student accommodation. The ad said there was the "option of converting the current 100 single rooms into 68 self-contained rooms as the plans have already been approved". The site contains a commercial kitchen with cold room, communal area, in-ground swimming pool and storage areas. As well as the lodge, the site has a four bedroom brick home that was previously used as a manager's residence.